Cordyne offers a full line of Siemens electric motor starters and starter packages. Siemens motor starters are simple and practical and provide essential solutions for industrial applications. Siemens starters serve a high degree in protection for application installation and can be purchased as stand-alone units for your application or can be integrated as part of a full industrial power control system. Heavy duty enclosure which is painted steel with ANSI61 gray powder coating. All components are mounted to enclosure’s back-pan. Enclosure is rated for NEMA 4, 3R, 13, 12, 1 applications. IEC Contactor with adjustable thermal overload (Class 10). NEMA, UL, CSA & IEC rated components only. A wide range of standard options make it possible to adapt a “standard” control to your particular needs. Oversized Control Power Transformer (optional). Units are assembled, pre-wired, and ready to go straight out of the box. Heavy duty enclosure which is painted steel with ANSI61 gray powder coating. All components are mounted to enclosure’s back-pan. Enclosure is rated for NEMA 4, 3R, 13, 12, 1 applications. IEC Contactor with adjustable thermal overload (Class 10). NEMA, UL, CSA & IEC rated components only. A wide range of standard options make it possible to adapt a “standard” control to your particular needs. Oversized Control Power Transformer (optional). Units are assembled, pre-wired, and ready to go straight out of the box. Molded Case Circuit Breaker with through-the-door handle. Heavy duty enclosure which is painted steel with ANSI61 gray powder coating. All components are mounted to enclosure’s back-pan. Enclosure is rated for NEMA 4, 3R, 13, 12, 1 applications. NEMA Rated Non-Reversing motor starter with three leg protection overload heaters (included standard-sized to rated chart amps). Reset pushbutton is standard on all units. NEMA, UL, CSA & IEC rated components only. A wide range of standard options make it possible to adapt a “standard” control to your particular needs. Oversized Control Power Transformer (optional). Units are assembled, pre-wired, and ready to go straight out of the box. Heavy duty enclosure which is painted steel with ANSI61 gray powder coating. All components are mounted to enclosure’s back-pan. Enclosure is rated for NEMA 4, 3R, 13, 12, 1 applications. NEMA Rated Non-Reversing motor starter with three leg protection overload heaters (included standard-sized to rated chart amps). Reset pushbutton is standard on all units. NEMA, UL, CSA & IEC rated components only. A wide range of standard options make it possible to adapt a “standard” control to your particular needs. Oversized Control Power Transformer (optional). Units are assembled, pre-wired, and ready to go straight out of the box. Includes a Molded Case Circuit Breaker with through-the-door handle. IEC Contactor with adjustable thermal Overload (Class 10) Oversized Control Power Transformer (optional), External Machined Flange Joint Design. Units are assembled, pre-wired and ready to go. Integral Cast Mounting Feet. Units come standard with Hinged Covers. S.S. (316) Captive Quick Thread Cover Bolts (optional) Ground Lug Package Cast Mounting Pan. Bosses Cast From Copper – Free Aluminum – Max 0.25% Copper Content. Aluminum, Stainless Steel Shot or Sandblasted Natural Finish. Enclosures Suitable for NEMA 4X. Cast Aluminum and Stainless Steel Hinge. IEC Contactor with adjustable thermal Overload (Class 10) Oversized Control Power Transformer (optional), External Machined Flange Joint Design. Units are assembled, pre-wired and ready to go. Integral Cast Mounting Feet. Units come standard with Hinged Covers. S.S. (316) Captive Quick Thread Cover Bolts (optional) Ground Lug Package Cast Mounting Pan. Bosses Cast From Copper – Free Aluminum – Max 0.25% Copper Content. Aluminum, Stainless Steel Shot or Sandblasted Natural Finish. Enclosures Suitable for NEMA 4X. Cast Aluminum and Stainless Steel Hinge. Includes a Molded Case Circuit Breaker with through-the-door handle. 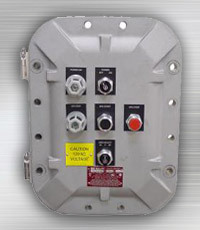 Heavy Duty, Corrosion Resistant, Molded Fiberglass Enclosure with gray injection coloring. All components are mounted to enclosure’s back-pan. The enclosure is rated for NEMA 4X applications. IEC contactor with adjustable thermal overload (Class 10). NEMA, UL, CSA & IEC rated components only. A wide range of standard options make it possible to adapt a “standard” control to your particular needs. Oversized Control Power Transformer optional. Units are assembled, pre-wired, and ready to go straight out of the box. Heavy Duty, Corrosion Resistant, Molded Fiberglass Enclosure with gray injection coloring. All components are mounted to enclosure’s back-pan. The enclosure is rated for NEMA 4X applications. IEC contactor with adjustable thermal overload (Class 10). NEMA, UL, CSA & IEC rated components only. A wide range of standard options make it possible to adapt a “standard” control to your particular needs. Oversized Control Power Transformer optional. Molded case circuit breaker with through-the door 4X handle. Units are assembled, pre-wired, and ready to go straight out of the box. Heavy Duty, Corrosion Resistant, 14 gauge Stainless Steel Enclosure with brushed finish. All components are mounted to enclosure’s back-pan. The enclosure is rated for NEMA 4X applications. IEC contactor with adjustable thermal overload (Class 10). NEMA, UL, CSA & IEC rated components only. A wide range of standard options make it possible to adapt a “standard” control to your particular needs. Oversized Control Power Transformer optional. Units are assembled, pre-wired, and ready to go straight out of the box. Heavy Duty, Corrosion Resistant, 14 gauge Stainless Steel Enclosure with brushed finish. All components are mounted to enclosure’s back-pan. The enclosure is rated for NEMA 4X applications. IEC contactor with adjustable thermal overload (Class 10). NEMA, UL, CSA & IEC rated components only. A wide range of standard options make it possible to adapt a “standard” control to your particular needs. Oversized Control Power Transformer optional. Molded case circuit breaker with through-the door 4X handle. Units are assembled, pre-wired, & ready to go straight out of the box. NEMA rated Contactor with Adjustable Thermal Overload (Class10), Oversized Control Power Transformer (optional). External Machined Flange Joint Design. Units are assembled, pre-wired and ready to go. Integral Cast Mounting Feet. Units come standard with Hinged Covers, S.S. 316 Captive Quick Thread Cover Bolts (optional) Ground Lug Package, Cast Mounting Pan. Bosses cast from Copper-Free Aluminum – Max 0.25% Copper Content. Aluminum, Stainless Steel Shot or Sandblasted Natural Finish. Enclosures suitable for NEMA 4X Applications. Cast aluminum and Stainless Steel Hinge. NEMA rated Contactor with Adjustable Thermal Overload (Class10), Oversized Control Power Transformer (optional). External Machined Flange Joint Design. Units are assembled, pre-wired and ready to go. Integral Cast Mounting Feet. Units come standard with Hinged Covers, S.S. 316 Captive Quick Thread Cover Bolts (optional) Ground Lug Package, Cast Mounting Pan. Bosses cast from Copper-Free Aluminum – Max 0.25% Copper Content. Aluminum, Stainless Steel Shot or Sandblasted Natural Finish. Enclosures suitable for NEMA 4X Applications. Cast aluminum and Stainless Steel Hinge. Includes a Molded Case Circuit Breaker and external operating handle.